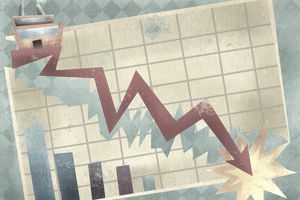 What Happens If Your Stock Goes Bankrupt? What happens if you own shares of stock in a corporation that goes bankrupt or becomes practically worthless? One of the more frequent questions investors ask is whether or not they will be responsible or owe money personally. The answer? Probably not, but it depends. You might be on the line under certain circumstances. If you have a brokerage account with margin capabilities, meaning you can borrow against the stocks in your account, you are responsible for repaying the debt, even if your entire account goes to $0. So, in an extreme example, if you owned $100,000 worth of Lehman Bros. and borrowed $25,000 against your shares to buy a new car, you will still owe the $25,000. What would likely happen is when your shares fell to $50,000, your broker would call you and demand you deposit more money in your account (this is known as a “margin call”). If you didn’t comply, they would sell your stock to repay the debt to protect their brokerage firm. What If I Have No Margin Debt and My Shares Are Non-Assessable? If your brokerage account has no margin debt then no, you won’t owe if the company goes bankrupt in virtually all cases. That’s because most stocks today are known as “fully paid and non-assessable.” If you have stock certificates, you’ll see that written somewhere on the shares. There are a few companies that have assessable shares, although these are extremely rare relics of past generations. Back in the 1960’s, for instance, American Express had assessable shares during the Salad Oil scandal that severely hurt the company. Had the firm been on the hook for millions it had been stuck with by a crook, the shareholders could have had to come up with the money based on the number of shares they own. Given the dangers, however, most firms, including American Express today, have long done away with assessable shares. “Why on earth,” you may ask, “would a company ever issue assessable shares?” It was a way for management to raise funds for expansion back in the 19th century, especially for railroad stocks. If more money was needed, the Board of Directors simply sent out a legal notice telling shareholders they had to send in $10, for instance, for every share they owned. Shareholders were on the hook and had to send the company money, which was then used to operate the business, and they were given more shares. Private equity firms (which are nothing but hedge funds that specialize in buying private businesses) work much in this way today, ironically. One caveat: This doesn't refer to stock in a private company or limited liability company you may own, such as a family business. In such cases, you need to probably get a copy of the Articles of Incorporation or the Operating Agreement, which are the legal documents that govern your stake in the company. It's not uncommon for older farmers, for instance, in Midwestern communities to own shares of a local bank that they purchased forty or fifty years ago. The stock of the bank may have little or no publicly traded market. Here, you would need to seek out an experienced attorney and accountant, especially if you happened to inherit these shares. Once a company has been delisted from a stock exchange as a result of bankruptcy, you will often have to fill out a worthless securities processing request. Your broker might charge you a fee for this service, perhaps $5 or $10. They will take care of removing the now worthless shares from your account and handling the paperwork. What Happens to Your Investment When a Stock Is Delisted?